Topics: Abbeyfield Society, Houses, Annett House, Sibley's Orchard, and Availability. Its 2 nameservers are ns7.x3hosting.net, and ns8.x3hosting.net. 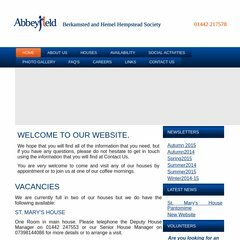 Abbeyfieldberkhamstedandhemelhempstead.co.uk's IP address is 83.170.96.81.